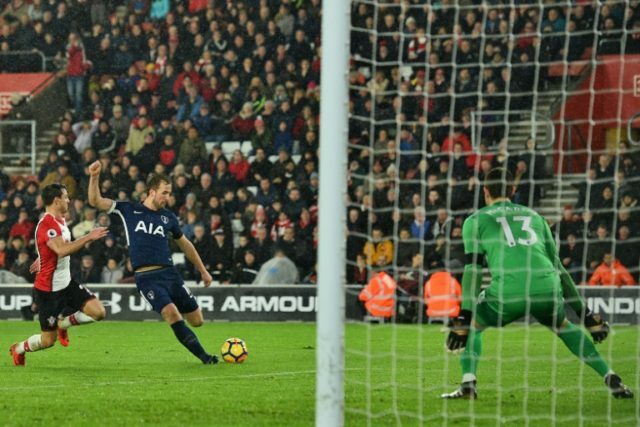 Southampton (United Kingdom) (AFP) – Harry Kane struck his 99th Premier League goal to earn Tottenham a 1-1 draw at St Mary’s on Sunday after Davinson Sanchez’s own goal had given Southampton an early lead. The result moves Spurs closer to Liverpool in fourth place but it was not enough to lift Southampton out of the relegation zone. But with Mauricio Pochettino’s side piling on the pressure in the closing stages against his former club, the Argentine will consider this a missed opportunity in Spurs’ hunt for a Champions League place. The form guide appeared to give Southampton little chance of victory but this was a spirited performance from the home side. Mauricio Pellegrino’s team had not won since November and dropped into the relegation zone this weekend. Abdoulaye Doucoure’s controversial last-minute equaliser for Watford denied Saints two precious points last weekend and pressure is growing on the Southampton manager, who has been the target of fans’ frustrations in recent weeks. Fortunes could hardly be more different for Spurs, managed by former Saints boss Pochettino. He has never lost a game at St Mary’s since leaving the south coast and his team came into this fixture unbeaten in their past five Premier League matches. Southampton took a deserved lead in the 15th minute when Sanchez deflected past his goalkeeper Michel Vorm after being tempted by Ryan Bertrand’s low cross from the left. But Kane moved onto 99 in the Premier League as he headed in Davies’s next corner, beating two Southampton defenders to the ball to score from close range just 197 seconds after Sanchez’s own goal. Spurs were close to taking the lead with Davies again the provider, this time for Moussa Sissoko, who volleyed his cross just wide.